A mostly instrumental tour of our Solar System. In the early 1900s composer Gustav Holst wrote the definitive orchestral suite about our planet's solar system, The Planets. Since then, it has served as the benchmark artistic endeavor which gave musical form to the science and majesty of our place among the stars. In the spirit of Holst, the latest in art commemorating our heavenly bodies is Planets, by Sally Tomato's Pidgin. This mostly instrumental song-cycle gives its own tour of the space around us, our cul de sac in the cosmos. Figurehead and iconoclast Sally Tomato is known for her unique subject matter and extended works, and this no exception. Her 'Pidgin' is made up of guitarist Carlos Severe Marcelin and drummer Eric Flint, the instrumentalists from her regular stage show (with an occasional cameo by Sally herself). On this album her band exudes a blend of traditional rock grooves and counterpoint, rhythms and orchestrations noticeably more progressive than those you would find on your mainstream radio station. The result is a rich and layered work. From the sublime counterpoint of Sol to the raunchy edges of Uranus and beyond, 'Planets' is uncompromising in delivering a vision for each of these mysterious floating rocks, including our own. 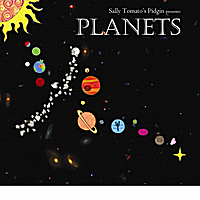 In 'Planets', Sally Tomato's Pidgin weaves planets, moons, asteroids, gaseous formations, and our star itself into a captivating and expansive musical journey. Orchestral accompaniment, poetic narration, and the many layers of Carlos Severe Marcelin's guitar and keyboard tracks lay upon a foundation of the earth-shattering drumming of Eric Flint. This pair has been playing music together for over 20 years and it shows. As the narrative of our solar system unfolds over the course of twenty tracks, an appreciation for the delicate balance of the universe and the luck of our own existence is implied through the universal language of music.